Enscroll is a jQuery plugin to replace conventional default browser scrollbars with nice looking one. Replacing scrollbars manualy is a tough process. 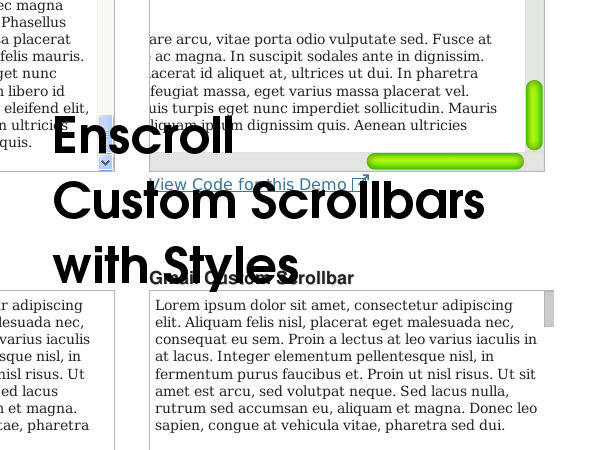 Enscroll will help you to design overflow of content with nice looking scrollbars. There are a countless number of designs and styles you can apply to these scrollbars, Start looking at the provided examples to see just a few of the advanced designs that are possible with the enscroll jQuery plugin. Include Jquery and the script into the page.